Alger Barrett, 78 of Barbourville, Kentucky, formally of Leslie County departed this life on Thursday, May 17, 2018 at the Hazard Appalachian Regional Medical Center in Hazard, Kentucky. He was the son of the late Chester and Chelsea Collett Barrett. He enjoyed playing bluegrass music, fishing, watching westerns, and baseball games. 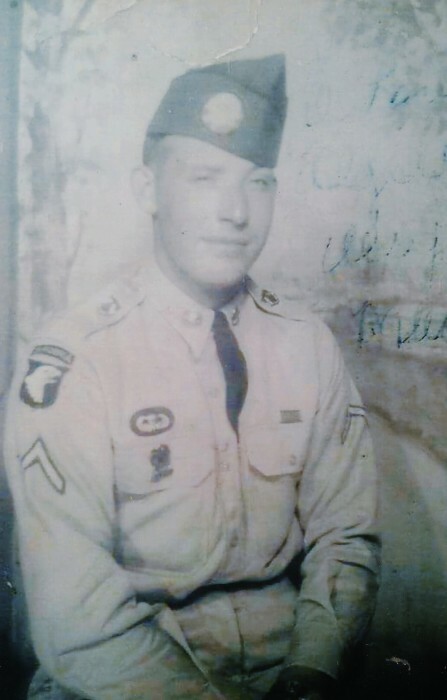 Alger served our country in the United States Army. Hes was preceded in death by his parents; three brothers Mckinnley, Paul, Wendal Barrett; three sisters Hazel, Virgie and Goldie. Those surviving are sons Bill Barrett and wife Tonya , of Barbourville, Kentucky, Brett Barrett of Barbourville, Ky and step-son James Brock. Daughters are Chantel Bays and Gary, Algina Sizemore, Anna Scott, and step daughter Stephanie Brock Cornett. Five brothers Chester Barrett Jr and Bonnie of Stinnett, Elmer Barrett of Stinnett, Caleb Barrett of Essie, Lynn Barrett and Wilma Barrett of Stinnett, Ky, James and Ethel Barrett of London, Ky.. Fourteen grandchildren and ninteen great-grandchildren A host of other family and friends. Funeral Services will be conducted at 2:00 P.M. Saturday May 19th, 2018 in the chapel of the Wolfe and Sons Funeral Home with Taylor Adams and James Bowling officiating. Burial will follow in the Bowens Creek Cemetery, Essie, Kentucky. The family will receive friends at the funeral home on Saturday at 11:00 A.M. until the funeral hour. Wolfe and Sons Funeral Home is in charge of the arrangements.